50 years ago in 1964 Her Majesty the Queen approved a new portrait for her coinage, and set in motion a chain of events that led to the creation of the most reproduced image in the world. The portrait in question was designed by Arnold Machin RA – and if you look in your pocket now you’re still likely to find a coin bearing the distinctive profile. 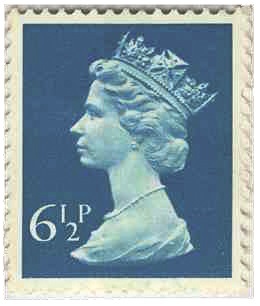 The 6 1/2p Definitive Stamp featuring Arnold Machin’s effigy of the Queen. Best estimates suggest that the Arnold Machin RA effigy of Queen Elizabeth II has now been reproduced on our stamps over 300 billion times – a staggering number. In fact, amongst collectors, UK definitive stamps are now simply referred to as ‘Machins’ because the image is so ubiquitous. But who is Arnold Machin RA, and how did he come to design this instantly recognisable image? Arnold Machin was born in 1911 in Stoke-on-Trent. Modelling and sculpture was in the family, but his father struggled to make ends meet with his freelance modelling job. Consequently Machin started work aged 14 at the Minton China Factory, as an apprentice china painter. But he could not keep away from sculpture, and after a working for many years in the arts was appointed an associate member of the Royal Academy of Arts in London in 1947. As if this wasn’t enough of an honour, in 1964 Machin was approached to design an effigy of the Queen for the new decimal coinage to be introduced in 1971. So, despite never having designed a coin before, Machin was granted four sittings with the Queen. Cleverly using the bas-relief technique, which creates a raised sculpture from a plaster base, Machin came up with a design the Queen appreciated so much she has insisted it be used unchanged on our stamps for the past 40 years. Perhaps testament to the enduring popularity of the image, and the design process behind it, one of Machin’s original plaster casts recently sold at auction for the princely sum of £18,000. And I don’t think this will be the last we’ll hear of record breaking Machin sales – as time goes by the power of the image will not diminish, yet the availability of collectables will. And now we are due to see a new portrait of the Queen on our coinage in 2015, this is bound to be an area to watch. The Westminster Collection is proud to present the first ever officially licensed silver philatelic set featuring Arnold Machin’s famous effigy of the Queen.